Javad was born into House Tharn of Cheydinhal. His mother was Euraxia Tharn, who was the ruler of Rimmen for several years. His uncle was Abnur Tharn, the Overlord of Nibenay, and Chancellor of the Elder Council during the reign of Emperor Varen Aquilarios. Before the Planemeld in 2E 582, Javad Tharn was considered a celebrity in the Imperial City, partaking in various social events. As time went on, Javad Tharn had garnered more influence and became involved in the dark arts of Necromancy, following his uncle's steps and becoming acquainted with Mannimarco, and the Order of the Black Worm. In 2E 578, Javad Tharn had reunited with Flaccus Terentius, an Imperial Envoy-Scholar that traveled Tamriel to write "The Improved Emperor's Guide to Tamriel." Javad had cast the scholar into the ruins of Nchuand-Zel, underneath the modern-day city of Markarth. Fortunately for Terentius, he was able to escape into Skyrim. 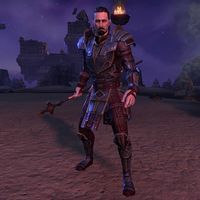 Eventually, in 2E 582, Javad Tharn was one of the leading figures in the campaign to capture the region of Reaper's March, a borderland between Elsweyr and Valenwood. Tharn had utilized dark magic to corrupt the Mane, Akkhuz-ri. Javad had enlisted the help of the Stonefire Cult, a cult dedicated to Molag Bal. Initially, the invasion over Reaper's March was meant for its annexation, but Javad Tharn had an ulterior motive that related to the downfall of Elsweyr and the First Aldmeri Dominion. Javad had assumed control of the Stonefire Cult, and had ordered for the construction of a Dark Anchor in the Temple District of Arenthia, during the Colovian Occupation. However, his plans were foiled by the Arenthian Resistance, and an Agent of the Dominion. The Dark Mane had been subdued. Javad's cult had wreaked havoc across Reaper's March, and the Dark Mane was ultimately sealed in the temple of Moonmont, by one of the Lunar Champions. The sister that was forced to vessel the Dark Mane was kept in Moonmont and later used by Javad in his final battle. Javad Tharn and the Stonefire Cult had launched an attack on the city of Dune. He took refuge inside the Temple of Two-Moons Dance as the Moon Hallowed, and the chosen Lunar Champion attempted to stabilize the conflict in Dune. As part of the Lunar Champion's final step, the two must walk the Two Moons Path, where they would face Javad Tharn, and the Lunar Champion becomes the Mane. The two witnessed a possible future which would result in the fall of the Aldmeri Dominion, should they fail in their quest. However, they were able to persevere and encounter both Javad, and the Dark Mane at the Den of Lorkhaj. In the end, the Mane, and the Moon Hallowed had prevailed, and the battle against Javad Tharn was over, with the noble's death in the process. Javad Tharn's soul would be cast into the fortress of Heart's Grief, in the planes of Coldharbour, imprisoned with other figures like him at the time, alongside Mannimarco. This page was last modified on 21 January 2019, at 13:20.